Because we have this particular machine right for you the first time around. The trick paint and pin-striping on the tank and side covers would probably have set you back a bundle. And we don't have to tell you what cast alloy wheels are going for these days. In the braking department, the 650/4 Custom is fitted with twin discs up front and a single disc rear. It's 64 horsepower 4-stroke engine is snugged into a stress-braced frame, with beefed up swingarms to avoid rear wheel steering effects under heavy side loads. 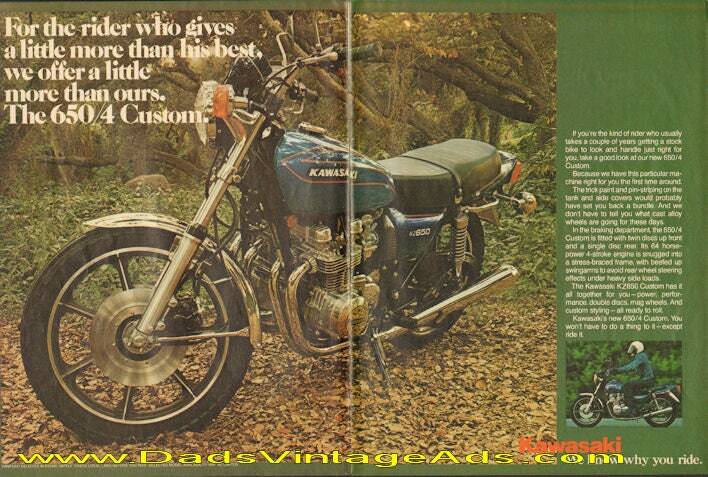 The Kawasaki KZ650 Custom has it all together for you - power, performance, double discs, mag wheels. And custom styling - all ready to roll. Kawasaki's new 650/4 Custom. You won't have to do a thing to it - except ride it.